In the mid 18th Century, Cobham Village’s water was supplied from a number of ponds and a parish pump with an underground cistern located in Cobham’s The Street, close to the Leather Bottle. 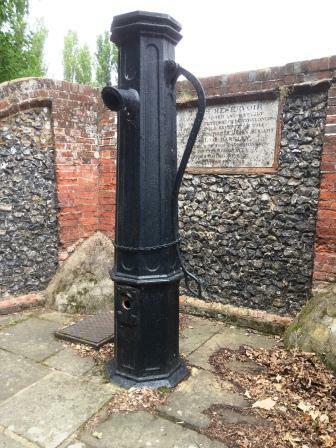 The parish pump being the sole supply of clean water at that time. Looking after the various springs, ponds and the parish pump was proving to be troublesome as the ponds were liable to silting up, overflowing onto The Street and/or freezing over in winter. Also the parish pump needed constant maintenance and repair. In 1778 the parish pump was moved from near the Leather Bottle to its current location, on land then owned by Bonham Hayes. On the 3rd July 1783 Bonham Hayes (then living at Meadow House) gave the land, water cistern and enclosed ponds in trust to the Rev. James Jones, officiating Minister in the Parish of Cobham, John Baker and Thomas Morris, Churchwardens and their successors. It was a condition of the gift that ‘a person shall be appointed’ (by the inhabitants paying towards the support of the water works) ‘to have care and superintend the said cistern and water works there to belonging for one year’. The voting and appointment was to take place on the second Tuesday in July each year. Notice of the yearly vote was to be given the two previous Sundays (presumably during the Sunday Church Service). John Huggins was duly elected on the 29th July 1783 to take up the post of Water Superintendent for the remainder of the first year. Two years later, at the meeting held on 12th July 1785, Bonham Hayes was elected Superintendent of the Cistern and the Works for the year. At the same meeting it was agreed that, ‘on consideration (of) expenses incurred in reparations of the said works, that a rate amounting to one half of the original rate should be made and collected in the said thereof by (Mr) Crowhurst the Superintendent for the last year’. What the expenses incurred were, or why the water works benefactor, Bonham Hayes thought it necessary to put himself forward for the post of Superintendent is not recorded. For the next 63 years the yearly election meetings were held and various men appointed to the post of Superintendent. But, by 1848 the condition of the cistern and water works had deteriorated to such an extent that it was estimated it would cost between four and five hundred pounds to make the necessary repairs and that there were insufficient funds available to cover the substantial sum. Fortunately, at a meeting of the Trustees held on the 17th February 1848, Robert Foster, informed those present that the Right Honourable the Earl of Darnley was ‘generously disposed at his own expense on completing his minority to put the said works in complete repair, or otherwise provide the means of supplying the Village water’. The Earl of Darnley’s offer was eagerly accepted and the repair work undertaken. It is not clear what works were necessary for the cistern’s refurbishment, but the cistern we see today is believed to be largely unaltered since that refurbishment. The cistern is constructed out of brick, and lined with a coating of pitch, for waterproofing. It has 4 vaults supported by Iron pillars on a brick bases and measures 12m X 8.8m X 3.86 high (to top of vaulting). Assuming that the water level was kept to an average depth of 3 meters it is estimated that the cistern would have held approximately 317,000 litres (70,000 gallons) of water. Trust records show that in 1896, 2,318 litres (510 gallons) of water a day were being pumped from the cistern. Over time, expenditure on maintenance etc. was outstripping the income from the rate. The accounts for 1884 show that the Water Rate amounted to £7-14s-6d, yet expenditure for the year amounted to £9-3s-0d. In response to the shortfall in income the Trustees agreed to increase the 3s/ rate to 4s/ and the 1s/6d to 2s/-. At the beginning of the 20th Century properties in Cobham were being connected to mains water supply. As these works were taking place, the Reservoir became contaminated and unfit for use (cause unknown) resulting in the Trustees of the Cobham Water Supply to hold a meeting to decide the how to best deal with the situation. ‘At a recent meeting of the Trustees of the Cobham Water Supply, it was decided to ask all ratepayers for half a year’s rate (to be collected in January), which they considered would cover the period to the completion of the New Water Works. They are aware that some few of the ratepayers are now using the water from the main, but as the rate is a very small one, the Trustees have no doubt that all will accede to their very reasonable suggestion, with a view to meeting the half year’s expenses, and winding up the trust. The works connecting the Villagers to the mains water supply was completed by the Higham and Hundred of Hoo Water Company by April 1902 and an application made by the Trusties to the Charities Commission for ‘winding up’ the Bonham Hayes Charitable Trust and for permission to sell the’ reservoir and pipes by which the water was supplied’ to the Earl of Darnley for the sum of £10. The Charitable Trust was finally wound up 25/08/1902. 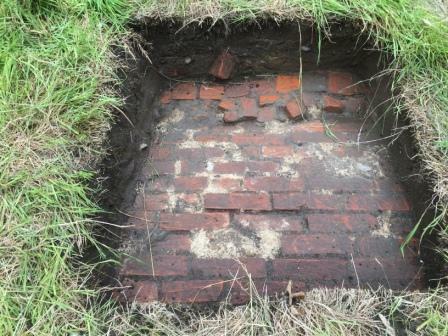 The photos above (provided by the author) were taken of the cistern’s roof during the 2017 Cobham Big Dig. Arnold, Ralph. 1949. ‘A Yeoman of Kent’. London. Hi Don, do you know the location of the well that had to be cleared of sand? John Beaumont:- Hi Don, do you know the location of the well that had to be cleared of sand? The short answer is no. I was unable to find written evidence or old maps that show the source(s) of the water supplying the Village Cistern. Roger II has used his dowsing expertise to traced the path of the water pipe from the cistern, up the path alongside the Meadow House to the field behind Meadow House, where the indications are that it heads towards Well Shaw. 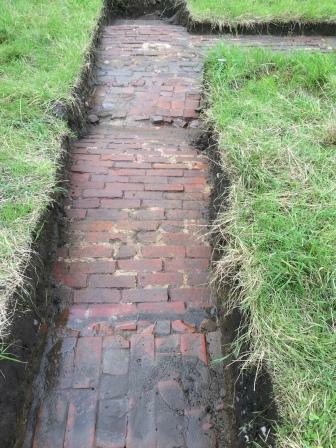 At well Shaw there is still evidence of water extraction i.e. there is a depression in a clearing with a modern substantial galvanized cylinder with inlet and outlet pipes and a much older cast iron pipe sunk into the ground. Evidence from the Cobham Water Trust’s records indicate that there may be more that one source of water supplying water to the cistern. My research into the water sources is continuing.